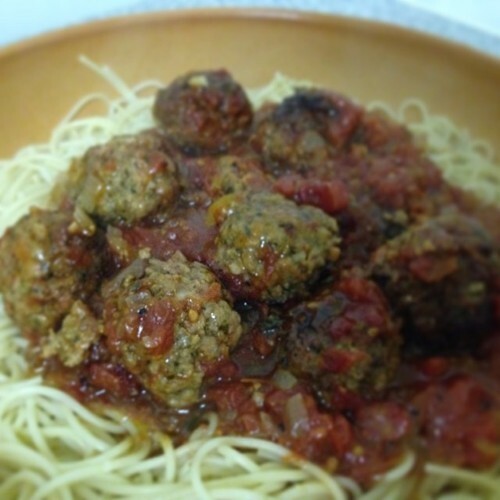 Spaghetti Meatballs is one of my favourite quick meals to cook. It takes very little time and is delicious. Which makes it one of my favourite meals to eat too. Pack of Bannatyne’s Pork Mince. Two cans of tomatoes (Chopped). Two cloves of fresh garlic. A whack of fresh herbs (despite what may be peddled on TV the dried ones are rubbish) - I have used margerum, flat leaved parsley, rosemary, thyme and a little sage. Our basil is still too small to be stealing from her. These are really what make the dish. Salt, Pepper and brown sugar. 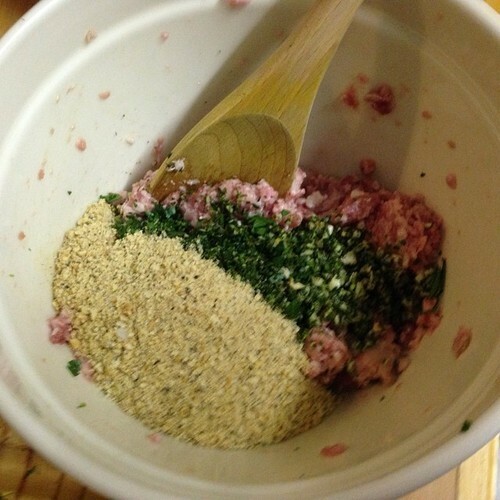 Mix the Bannatyne’s Pork Mince, chopped garlic, crushed Pro-vita’s and most of the chopped herbs very well. The more you work the mixture the stickier it gets. Don’t forget to season. 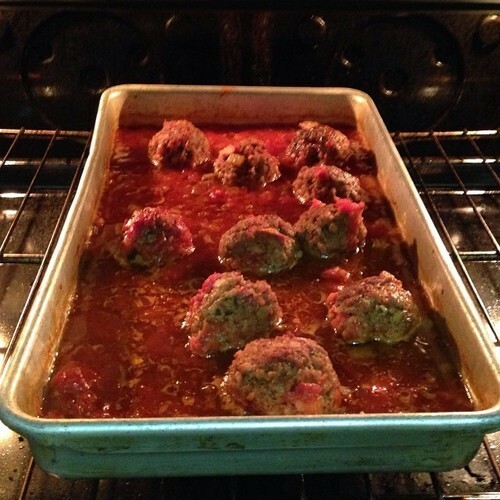 I like meatballs the size of golfballs. 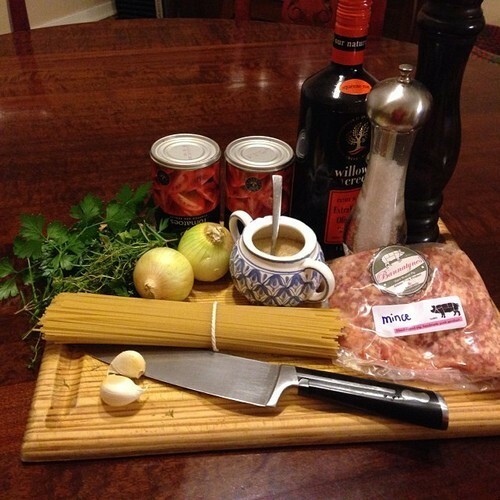 I also prefer to add the onions to the sauce rather than the meatball, mostly because it is better that way. 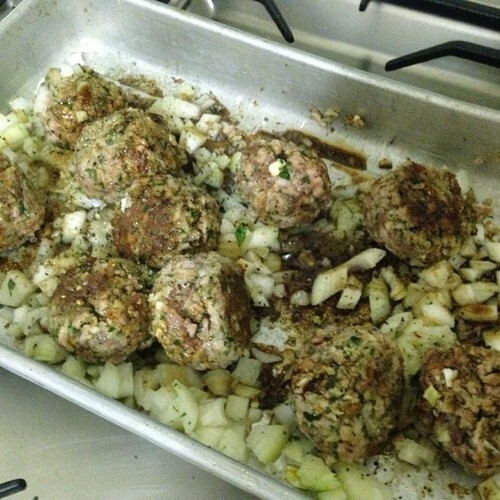 Brown off the meat balls, then add in the onions, add the cans of tomatoes, a good splash of Balsamic vinegar and a little olive oil (not too much the fat of the mince will render out of the meatballs flavouring the sauce). You must season and don’t forget to add in about two and a half teaspoons of sugar. You can add the wine in now too. Pop the whole thing into the oven - don’t cover it. let it bubble away until you are ready for it or until the pasta is done. About 40 minutes should do the trick. 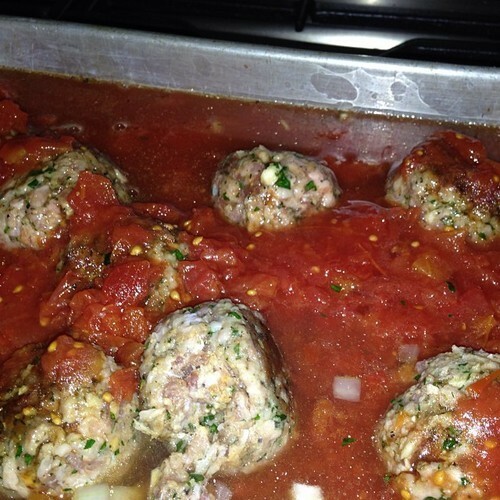 The longer you leave it the thicker and more intense the sauce becomes, which means that if you are going to be a while, keep adding water to the sauce so that it does not burn. I tend to stir it a couple of time, just so that all the exposed bits get a turn to brown up nicely. The sauce goes a long way so don’t stress too much about the fat, but If you are worried about it, which you really shouldn’t be, because you are perfect the way you are - you can spoon off the excess fat. I find that if you stir it into the sauce, it really is very very delicious. It also helps to develop character and a sense of humour which in turn will lead to a more fulfilling life.